This volume presents five different methods recently developed to tackle the large scale behavior of highly correlated random systems, such as spin glasses, random polymers, local times and loop soups and random matrices. These methods, presented in a series of lectures delivered within the Jean-Morlet Chair (Spring 2013), play a fundamental role in the current development of probability theory and statistical mechanics. The lectures were: Random Polymers by E. Bolthausen, Spontaneous Replica Symmetry Breaking and Interpolation Methods by F. Guerra, Derrida's Random Energy Models by N. Kistler, Isomorphism Theorems by J. Rosen and Spectral Properties of Wigner Matrices by B. Schlein. It is targeted at researchers, in particular PhD students and postdocs, working in probability theory and statistical physics. 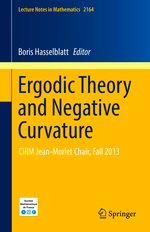 Focusing on the mathematics related to the recent proof of ergodicity of the (Weil–Petersson) geodesic flow on a nonpositively curved space whose points are negatively curved metrics on surfaces, this book provides a broad introduction to an important current area of research. It offers original textbook-level material suitable for introductory or advanced courses as well as deep insights into the state of the art of the field, making it useful as a reference and for self-study. This volume presents a panorama of the diverse activities organized by V. Heiermann and D. Prasad in Marseille at CIRM for the Chaire Morlet event during the first semester of 2016. It assembles together expository articles on topics which previously could only be found in research papers.